I was in a quandary, a fix, a pretty pickle. I did not want the students to belittle children’s writers, for the children shouldn’t think that writers are “fabricators of unrealistic, impractical stories promoting questionable values”. So, to give a positive feel to the tale, I decided to re-write Cinderella. Here is my version: Cinderella lived with her father, stepmother and two stepsisters. Two young girls from each family were being invited for the prince’s grand ball. Transport was to be arranged by the palace. The ball would conclude before midnight so that the girls who attended could be home by 12 midnight. Immediately, the opportunistic wicked stepmother said brusquely, “My two daughters (Cinderella’s stepsisters) are eligible for the ball.” But Cinderella’s father, who was bent on fair play, said, “A task will be assigned to all three girls. The task is to clean an equal number of dirty dishes. The two who do the best job can go to the ball”. Half an hour after the task was set it was clear that Cinderella was the winner. She had not only cleaned the dishes fast, but also had done her job meticulously. Rosy (the stepsister who was next best) would accompany Cinderella to the ball. 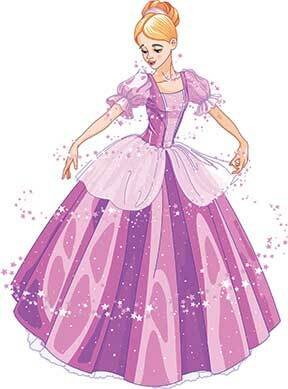 Cinderella, with her innocent beauty and charming personality, grabbed all eyeballs including the prince’s! But soon it was nearing 12, so Cinderella and Rosy scampered out. In her rush, Cinderella lost one of her glass slippers. The next day, the prince held a unique ‘Lost and Found’ event where anyone could claim the glass slipper provided they show the other matching one. Rosy snuck out stealthily with Cinderella’s glass slipper, but the prince was no simpleton. When he asked Rosy to wear the pair and walk, she couldn’t. Chagrined, she broke down and confessed that the pair actually belonged to Cinderella. Subsequently, Cinderella was summoned. The prince looked at the gorgeous, glowing beauty, fell on one knee, and spontaneously popped the big question! Unlike the unfair treatment meted out to Cinderella in the original version, here the selection criteria was fair and was based on merit, ability and hard work. Therefore, Cinderella did not have to sneak out. Unlike the original version that has a fairy Godmother with a wand and magical powers, this version is realistic and practical where the inviters provide transport, showing good manners which we can emulate. Lies are not told except at the end when Rosy lies in order to claim the glass slipper. However, a sense of fair play descends on her; she breaks down and confesses to the actual owner. Clearly, Cinderella is the heroine of the day although she is the underdog. Nevertheless, she emerges triumphant due to her sincerity and appropriate attitude. Indeed, fairy tales are not just of extraordinary people but ordinary people with a little ‘extra’. Ultimately, fairy tales should inspire…and not backfire! The author is a teacher, speaker, and children’s writer. She writes feature articles, short stories, poems, plays and songs. She takes classes for Journalism Club and Writing Skills. She can be reached at heeranawaz@yahoo.com.